Questions related to Budget are always asked in various competitive exams including UPSC and others. Students preparing for competitive exams must go through the budget thoroughly. To understand the announcements made in the budget, some basic terminology must be learned. The Finance Minister Piyush Goel is presenting the union budget today i.e. 01 Feb 2019. 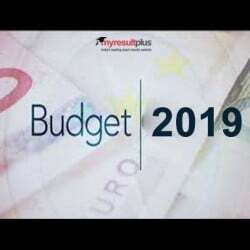 To understand the budget, you just need to learn the basic terms and their meanings. Have a look below. - If the government sells its stake in a public sector company in the private sector, then it is called disinvestment. This stake is sold by the government through shares. These stakes can be sold to either an individual or a private company. - When the central government lacks money, it issues bonds to absorb money from the market. This is a kind of debt, which is paid by the government within a set time after the payment is received. Bonds are also called credit certificates. - Whatever financial transaction takes place among the Central Government, State Governments and the governments present in other countries of the world, it is called 'balance of payment' in the budget language. - Balance budget occurs when both expenditure and earnings of the government are equal. - When any luggage is imported from any other country in India, the tax charged on it is called Custom Duty. It is also called 'Seema Shulk' (सीमा शुल्क). The customs duty is charged as soon as goods are dropped in India by sea or by air. - Excise duty (उत्पाद शुल्क) is charged on those products that are manufactured within the country. This fee is applicable to the product's manufacturing and purchase. At present, there are two major products in the country, which provide highest earning to the government. These are Petrol/ diesel and liquor. - The extra debt taken by the government is called a fiscal deficit. Actually, the fiscal deficit is an additional burden on the domestic debt. It reduces the difference in the income and expenditure of the government. - The difference in the country's fiscal deficit and interest payment is called the primary deficit. The data of primary deficit reveals how big or small is the interest payment to any government. - Gross domestic product (GDP) is the total production of total goods and services offered in the country during the financial year. - A direct tax is a tax, which is imposed on the income of individuals and organizations, regardless of the source of the income. Investment, pay, interest, income tax, corporate tax, etc. are only made under the direct tax. - Capital Assets, which are kept for less than 36 months, are called Short Term Capital Assets. In the case of shares, securities and bonds, this period is 12 months instead of 36 months. - Taxes imposed on customers while buying goods or using services are called indirect taxes. GST, Customs Duty and Excise Duty etc. come under Indirect Tax. - When a business or professional invests in any item or purchases for any purpose, the property purchased with this amount is called a capital asset. It can be anything from bonds, stock markets and raw materials. - Profits gained from the sale or transmission of capital assets is called Capital Gains. - A person who is liable to pay tax under the Income Tax Act is a Taxpayer. - The financial year if counted from 01 April to 31 March of the next year. All taxes are applicable during the period.